Lexington, Ky. — On Sunday, Nov. 6, 1977, a small embankment dam located above Toccoa Falls Bible College in Georgia failed, releasing a wall of water through a steep ravine and into the campus, killing 39 people. The historic failure along with several other major dam failures in the 1970s led to establishment of the National Dam Safety Program and many state dam safety programs around the country, which work together to reduce the risk of dam failures and incidents in the U.S. The urgency of this mission continually increases as populations increase downstream of the nation’s more than 90,000 dams. At approximately 1:30 a.m., the Kelly Barnes Dam failed, sending floodwaters over 186-foot-high Toccoa Falls and onto the campus of Toccoa Falls Bible College. The steep ravine between the dam and the college funneled the water into a swift and powerful wave, about 25 feet high. Students, faculty, and staff living on the campus a short distance downstream were caught unaware as they slept. The flood caused an estimated $2.8 million worth of damage, predominantly confined to college property. The dam likely failed due to high water finding its way through irregularities and defects in the dam. The watershed above the dam had received several inches of rain over the few days leading up to the failure and up to an additional 3.5 inches on the night of the failure. The dam had not been maintained for years and was covered with trees and woody vegetation. The Kelly Barnes failure was a catalyst for change in dam safety. Georgia natives Jimmy and Rosalynn Carter, the recently elected president and first lady, learned of the disaster while at church. 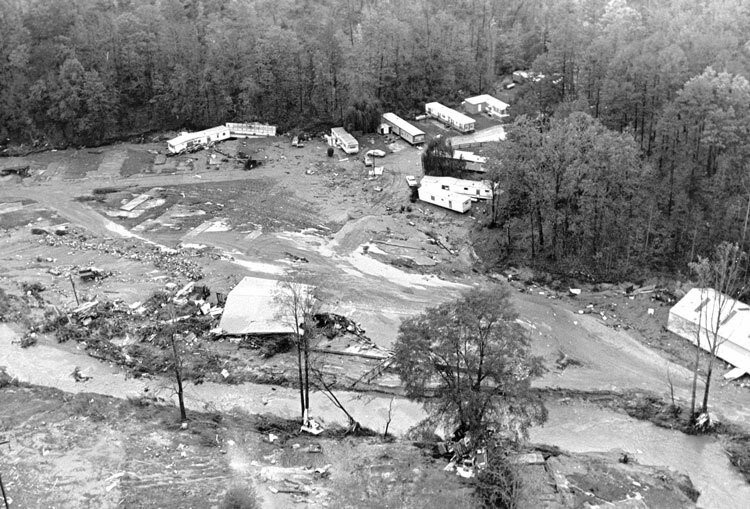 Rosalynn left directly for Toccoa Falls and was onsite as first responders removed debris and recovered bodies from the rubble. On December 7, 1977, one month after the failure, President Carter directed the Secretary of the Army to immediately commence the inspection of more than 9,000 non-federal dams that posed a high potential for loss of life and property, were they to fail. Carter made $15 million available for this “Phase I” inspection program, which revealed the unsafe conditions of the vast majority of non-federal dams and ultimately led to more sound dam safety policies on both state and federal levels. These actions in the wake of the Kelly Barnes dam failure were laudable, but the tragedy might have been averted altogether had Congress followed up on legislation passed five years earlier. The 1972 National Dam Inspection Act (PL 92-367) set a path toward improved dam safety nationwide, directing the U.S. Army Corps of Engineers to create an inventory of all non-federal dams meeting certain height-impoundment requirements, to inspect high-hazard-potential dams in the inventory, and to make recommendations for a comprehensive long-term program for inspecting and regulating dams nationwide. Unfortunately, Congress failed to allocate sufficient funds to carry out the inspection program or formulate a national dam safety strategy until 39 people were killed at Toccoa Falls. Today, the National Inventory of Dams includes more than 90,000 dams, more than 15,000 of which are classified as high-hazard-potential structures — that is, their failure would likely cause loss of life. It is estimated that about 12 percent of these high-hazard potential dams need repair or upgrade for safety reasons. The vast majority of these dams are state-regulated, and, while state dam safety programs are in far better shape than they were 40 years ago, many challenges remain: foremost among them are lack of adequate funding for state dam safety programs, educating dam owners about their responsibility for dam safety, and lack of funding for dam maintenance and rehabilitation. As downstream populations increase, more and more dams pose potential threats to communities. ASDSO estimates that it will require almost $22 billion to upgrade or repair the most critical (high-hazard potential) federal and non-federal dams in the United States.